Imagine having job leads delivered directly to your computer or smart phone just seconds after they are posted by employers. This week's Hot Job Site, TweetMyJOBS, gives new meaning to the phrase "hot off the presses." Founder Gary Zukowski has figured out a way to leverage Twitter to help job seekers source job leads and apply faster than they would be able to using more conventional methods of search. AOL recently interviewed Zukowski to learn more about the power of TweetMyJOBS. 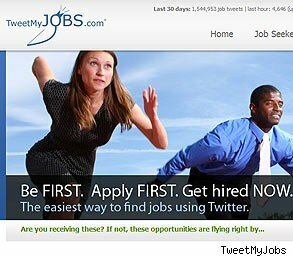 A. TweetMyJOBS is a comprehensive social media recruiting company featuring the largest Twitter job board in the world. We can handle a company's entire social media recruiting presence on Twitter, Facebook, and LinkedIn. We help with company branding, candidate tracking, and job posting management. And we connect employers and candidates instantly. Q. How does TweetMyJOBS work? A. Imagine a TV that has 150 million channels. There are some channels that you watch because it has shows and programming that apply to you. There are also many channels that you never watch because the format or content doesn't appeal to you. Twitter is very similar, except that each channel is a user that you can listen to. You follow the users that tweet relevant content to YOU. When it comes to jobs, the same rule applies. A job seeker only wants to get jobs tweeted to them that are relevant to them. This is typically defined by geography and functional job type. So what we've done on Twitter is create close to 10,000 Job Channels for job seekers to "tune into" (follow), which are location/job type specific. A job seeker simply has to register with tweetmyjobs.com, enter the location and type of job they are looking for, and then follow the appropriate job channel (or channels) that match their profile. After that, jobs that match this profile are tweeted directly to the job seeker via their preferred communication channel, and can even show up as text messages on their mobile phone the instant that the job gets posted. This gives the job seeker a leg up because they get the best chance to be the first to apply to these jobs. Employers also have the early-bird advantage of reaching targeted job seekers instantly as soon as they post a job. It's really a win-win. Q. What was the inspiration for TweetMyJOBS? A. I came up with the concept at the end of 2008, after trying to use Twitter to recruit for my IT consulting business. There was not a good way to target job seekers, and I realized that there was an opportunity to build an intelligent platform on top of Twitter that would benefit both employers and job seekers. It was only a matter of time before we extended our reach beyond Twitter -- a goal we achieved this year with added Facebook and LinkedIn functionality. Q. What's your favorite feature on the site? A. I really like the extra features that social media has enabled us to provide to our customers, such as our brandable TweetMap, our @TweetMyResume channel for job seekers to tweet their resume, and our FacebookJobBURST application, which takes each job posting and automatically distributes it to job seekers based on geography and job type. Q. Can you share a success story about someone who landed their job using TweetMyJOBS? A. We've heard many, but my favorite is still the first one we heard last year. A marketing professional in New York was out of work for nine months and had tried everything to find a job, including paying $1,000 for a resume rewrite. He heard about TweetMyJOBS one Sunday morning, registered with the site, and that afternoon got a tweet for a marketing position at a Subaru dealership nearby. He called them up that day, had three interviews over the next week, and got the job that Friday. Q. What's on the horizon for TweetMyJOBS? A. We are planning to expand our sales efforts into the UK/Europe over the next year. As for technology, we are planning some innovative mobile recruiting tools, leveraging the continued growth of the smart phone market.